Enter For A Chance To Win Pass To See Rampage on April 9th at 7:00 PM in Albuquerque. 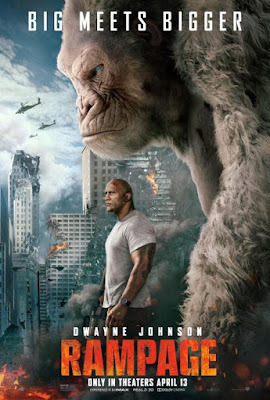 "Rampage" also stars Oscar nominee Naomie Harris ("Moonlight"), Malin Akerman (TV's "Billions"), Jake Lacy (TV's "Girls"), Joe Manganiello (TV's "True Blood"), and Jeffrey Dean Morgan (TV's "The Walking Dead"); as well as P.J. Byrne ("The Wolf of Wall Street"), Marley Shelton ("Solace"), Breanne Hill ("San Andreas"), Jack Quaid ("The Hunger Games: Catching Fire"), Matt Gerald (TV's "Daredevil"), Jason Liles ("Death Note"), Demetrius Grosse (TV's "The Brave"), Will Yun Lee (TV's "Hawaii Five-O"). "Rampage" opens in theaters beginning Friday, April 13, 2018.